Can you believe November is more than halfway complete!? Is it getting colder where you are? It got chilly a few weeks ago in Dallas, then got quite warm again, and is now leveling out in temperatures that are just about perfect for running! Dressing properly to run outside hasn’t been too difficult in Texas this year, but I’ve definitely been through the gamut of temperatures throughout my running lifetime. After growing up in Dallas, I started running at the beginning of my four years in Boston (but admittedly took to the gym for the first few years rather than braving the winter weather). I then spent 3 years in the heat and humidity of Miami, headed back to the cold of Chicago for two years (and was only confined to the treadmill a tiny handful of times! ), and have now made my way back to Dallas. Talk about weather confusion! I will always prefer running in the cold to the heat – you can always pile on more and more clothing, but you can’t escape the heat! As I’ve mentioned before, the heat really negatively impacts my running performance and times, so I’d choose the cold any day. Living in these different climates has taught me a few things about how to dress for various temperatures. The “common rule” is to dress for running as if it were 20 degrees warmer outside, but this is hard to put into practice, because I wouldn’t be just standing around outside for an hour if it were 5 degrees out! Instead of following this rule, I’ve developed my own guidelines – this is what works for me, and I can’t guarantee it will be the same for you … but I hope it helps! 15-25 degrees: leggings or running tights, long-sleeved shirt with running fleece, plus thick gloves and thick hat or running mask/ balaclava. 0-15 degrees: leggings or running tights and wind pants or sweat pants, long-sleeved shirt with running fleece and wind jacket, plus thick gloves and running mask/ balaclava, plus hand warmers. I really wish I had some pictures of my true cold-weather running gear to show you, because it’s pretty hilarious! Sadly, those have escaped the camera. For my first marathon, my mother-in-law gave me a hand towel at the start (I’m not sure why?!?) and I was so desperate for extra warmth that I stuffed it in the neck of my shirt like a scarf, and ran the entire marathon with it! Dressing in layers … carefully. Layers are key for running or exercising in the cold weather, because they provide additional insulation, and allow you to adjust as necessary. However, it’s important that the layer closest to your skin is a “technical” material (moisture-wicking fabric rather than something like cotton which will remain wet and cling to your skin). If you don’t have the right fabric next to your body, you will only get colder! Don’t get into a hot shower immediately … everything will tingle, in a painful way! Don’t forget to hydrate! You won’t feel as parched and thirsty while you’re running in the colder weather, but that doesn’t mean you don’t need to re-hydrate from your workout! So tell me in the comments … Do you prefer to work out in hot or cold weather? Is it cold where you live? Do you have any tips for running or exercising in cold weather? Despite having lived in Canada for most of my life I have yet to see anyone running with a balaclava…probably because you look like you’re going to mug someone if you wear one haha! Is it sad that one of the main reasons I miss running is because I haven’t been able to wear any of my winter running gear? HAHA, this made me chuckle. Yes, I do look like I’m going to mug someone when I wear that!!! I’ve never had to break it out in Dallas, but I was all over the streets of Chicago wearing my balaclava … and I definitely got some strange looks. Totally worth it, though! It is so cold outside already I can’t believe it! I layer layer layer! Whenever I look for long sleeve options during winter I always buy a size bigger than I usually wear so that I can layer beneath it. Funny story about the balaclava – my husband wears them when it gets really cold and one day he was running by a school and needed to use their bathroom which is never a problem but he forgot he had that mask on and no one would let him in. I wonder why! lol He felt so bad afterwards. Is it totally crazy to say I’m jealous of the cold? It’s still in the upper 50s to low 60s in Dallas, and I’m ready to really NEED to bundle up! The grass is always greener, right?! That’s so funny about your husband wearing the balaclava in the school!! 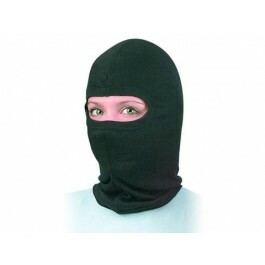 I have definitely run with a balaclava – I got a great one last year that is fantastic for breathing as well as warmth! 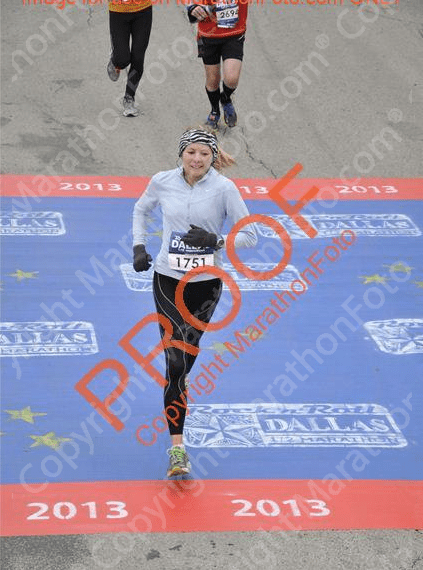 I’ve mentioned that I have run as low as -15 (with added wind chill) … which is similar to your lowest set of clothes. – Double top layers and double bottom layers. Also double gloves. Balaclava, neck warmer, and my thickest hat. Since I don’t have to worry about a pony tail or anything, I just use hats – I have three levels: baseball-type (tech material), light skull-cap, and heavy winter. On those 30-40 days I will choose between the heavier ones based on wind. Wind is definitely a wild card, as we live on a hill and all of my routes vary in direction and exposed/blocked areas. And one of the most dangerous things is over-layering and then removing layers after you are sweaty … that can be the express route to hypothermia. Glad you got a new one, Michael – the fabric really is key, as I’ve had some of them freeze on the outside from the moisture of my breath! Crazy! I totally hear you on wind, and I didn’t add in that factor because it was kind of complicated to put in a post like this. But, after living in Chicago, I do know that it makes a huge difference! Crazy that you’ve run in -15 … the coldest that I remember running in was -8, and it wasn’t pleasant! Thanks for the tip on hypothermia. Thanks, Gary! Yes, if I had “taken the day off” all of the days that the weather was not ideal during our 2 years in Chicago, I really wouldn’t have been running too much! How funny that your layered clothing got you into the habit of the out and back. I personally prefer the out and back also, although it seems most people prefer a loop! Well this officially makes me reallyyyyy miss running outside!! Even in the Canadian frozen temps. Hopefully soon 🙂 great tips. I am all about layering and personally, I’d rather be hot than cold. Yes, I hope it’s soon for you, too! You SAY you’d rather be hot than cold … but we’ll have to get you out running in the Texas summer. It’s SO brutal! I think that’s what made me appreciate cold weather running :). It must be the California weather that I am used to but I look more like your 25-40 degree clothing when it’s 40-60 degrees! I don’t think I could ever live anywhere else now. Lol! Haha! Yes, I should have put a footnote with a message that this does not apply to Californians. Your weather only varies by 20 degrees the entire year, so you have to find a way to squeeze in all your winter clothes even without the temperature variations ;). I hope my husband doesn’t read this, because he’s dying to move to California! Just kidding, some great tips as usual- Not being a runner, I often wondered how you guys stayed warm during the Winter- especially when seeing people out and about running is thin clothing! When its cold I usually wear compression pants under my shorts and an oversized hoodie. The joys of lifting! Arman @ thebigmansworld recently posted…WIAW- Sunlight at dinner time! Haha!!! Sorry … even while I was writing, I thought to make a note for people in the Southern Hemisphere … but clearly forgot. Oops! Yes, thin clothing works just as well, as long as it’s technical fabric and layered! 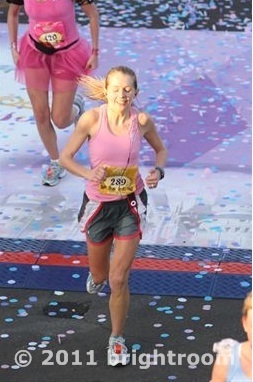 Sydney has lots of runners … maybe we’ll turn you into one after all! I think I prefer cold weather but only if it isn’t windy. If it is windy then I would take hot weather over wind any day of the week. I bought gloves for running earlier this year and went on 1 run with them and my hands got so hot after 10 minutes of running I had to take them off and just got way too hot. Love all these tips especially the layering. Michael Anderson recently posted…Throwback Thursday – When My Babies WERE Babies! You’re right about the wind, Jan … it makes a big difference! You and I must be opposites – my hands have such bad circulation that they almost never get hot. So send over your running gloves :)!! Lol I would seriously give them to you if postage was cheaper as I will never use them again. It is weird as my circulation especially in my hands and feet is usually terrible too but I think as I run, eventually my hands and feet’s circulation is actually ok for once. That’s so nice, thanks Jan! Happy Friday! Oh wow … blue hands?! That’s scary! Mine have often gone completely numb, to the point where I’m unable to move them, but I’ve NEVER had them turn blue! You should definitely try the heating packs – they helped me a lot! They have some reusable ones, too – pricier at the beginning, but worth it in the long run. Be careful with yourself!! 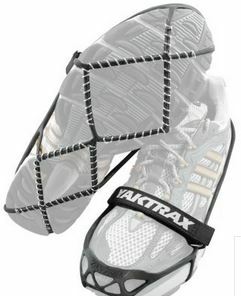 The Yaktrax for the shoes are billiant. I love love love runningoutside in the winter, but am scared to death to wipe out on the ice and REALLY hurt myself and be out for months! But I would feel so much better with those on my shoes!! Andrea, I would highly recommend them! Even though they may slow me down a tiny bit, it is SO worth it for the peace of mind that I won’t slip nearly as easily, and even if I step on a patch of ice, I can keep running! I got them after I slipped and bruised my tailbone, which was so painful and made me afraid of falling again! Hope they help you out if you get them! 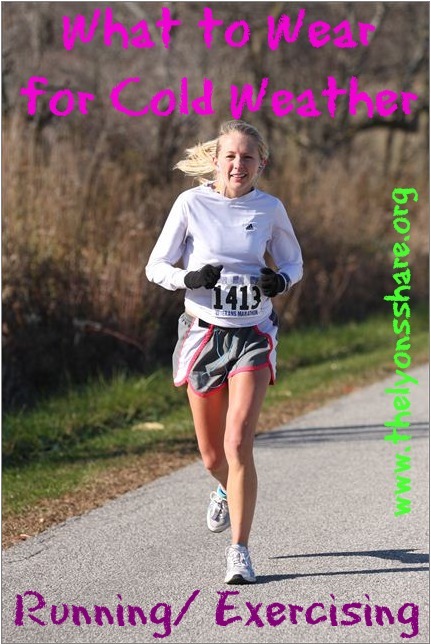 Read your wonderful article on dressing for cold weather running. I’m trying to get the best suggestions for a upcoming New Year Day run. It’s a 10 miler with expected a.m temperature of 28 degrees. What would you suggest?? Good luck on the run, Beverly! I would probably suggest leggings, a long-sleeve wicking shirt, a technical jacket, and nice gloves. Enjoy and Happy New Year!